Posted January 14, 2015 by The Rapid & filed under News. It can be stressful trying to find a spot to sit or stand. If the bus is crowded, try to walk all the way to the back and avoid saving a seat for your backpack to make more space available for others. Keep your eye out for someone who might need a seat more than you do. Another piece of advice: avoid talking on the phone loudly. Chances are fellow riders will not want to hear all about your latest problems and concerns. Riders should stay seated until they reach their destination. However, if the bus is crowded and standing is necessary, remember to hold onto either the overhead strap or the bars to the side. Balance will save you from falling on a stranger and creating an awkward situation. Be aware of your surroundings while waiting and riding the bus. If you feel uncomfortable, sit up front behind the bus driver. Planning ahead is crucial, especially during peak times and when you are heading to an important appointment. For GVSU routes, the peak times for Monday through Thursday are 9 a.m., noon, 2 p.m. and 5 p.m. Fridays are busy around 9 a.m. and noon, generally tapering off as it gets later in the afternoon. Plan your route ahead of time so that you know when to pull the cord to signal to the driver that you will be exiting at the next stop. Don’t be afraid to ask the driver any questions about your route. Learn the bus schedule so that you don’t have to wait outside in the cold for longer than necessary. The Route 50 buses run every six minutes on weekdays and about every hour on weekends. Check gvsu.edu/bus for more specific times. When you get ready to exit, remember to gather all of your personal items and winter accessories you brought along during your ride. Left something behind? All forgotten items are kept at Central Station. You can call The Rapid Information line at (616) 776-1100 anytime Monday through Friday between 6:30 a.m. and 6:30 p.m or contact or contact Lost & Found online. Want to know exactly when the bus will arrive? Search for The Rapid bus routes on the MyStop app (iPhone only) or the Transit App (iPhone or Android). Don’t have a smartphone? Check Rapid Connect your computer’s internet browser before heading to the bus stop. – Public transportation can save the U.S. 4.2 billion gallons of gasoline every year, reducing dependence on oil. – The Rapid saves the GVSU community over 2 million rides, 20 million vehicle miles and $11 million in vehicle operating costs. 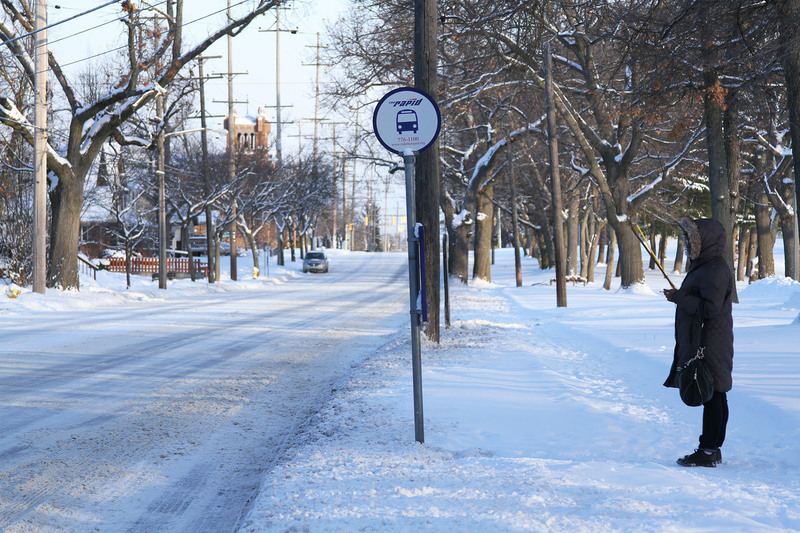 – Park and Ride: GVSU students, faculty and staff can park in marked areas and ride the bus to campus for free. The Standale Meijer and the Walker Fire Station have parking designated for this purpose. However, it is best to avoid overnight parking, as the vehicle may be ticketed or towed. This can help save gas money, avoid purchasing a parking pass and reduce emissions. – The Rapid has five hybrid-electric buses operating with green roofs to protect the environment by burning less fuel and emitting fewer pollutants into the air. The Rapid also uses ultra-low sulfur diesel, which emits 90 percent less pollutants than before. – The buses feature a battery-powered electric motor that provides most of the power at slower speeds and a smaller clean diesel engine that takes over at higher speeds.